A baby’s skin is considered to be some of the most soft and supple that you can find, but baby’s skin can be tremendously sensitive during their first months of life. It’s important to find a baby lotion that not only keeps baby’s skin moisturized, but also protects baby from any negative reactions or sensitivities. The kind of lotion that an adult uses is not suitable to a baby for a number of different reasons, and that’s why you need a special formulation that is designed to nurture your baby’s skin. Special organic and soothing ingredients such as lavender, aloe, oatmeal, and chamomile are fantastic for keeping baby calm and nourished. What you will most definitely want to avoid are fragrances, dyes, and preservatives. These harsh ingredients can give the baby an allergic reaction of the skin or eyes. Sometimes shopping at your local health food store is a great way to find the most natural baby products. There’s nothing more uncomfortable for baby than having diaper rash. This condition can make a baby, and baby’s mom, totally miserable. That’s why it’s important to find a diaper rash ointment that soothes the rash and prevents more discomfort. 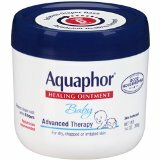 There are a number of different diaper rash remedies out there, but Aquaphor provides a convenient solution that can be found at your local drug store. This gentle and effective formula is designed to moisturize, soothe and protect with chamomile essence and B5 vitamins. There are no perfumes, dyes, or preservatives in this ointment, making it perfect for baby’s delicate skin. Not only is this great for diaper rash, but it can also be used on dry, chapped skin, nose, or hands. Your baby can experience relief of symptoms within 6 hours of applying this ointment, and even mom can reap the benefits of using this ointment on her skin. Aveeno is considered to be one of the best brands for sensitive skin, and their specially-formulated products for baby’s skin have the same nourishing ingredients that work for adults, with special features that make them perfect for baby. The genius behind the Aveeno products is the power of oats. This soothing ingredient is very calming and nourishing to the skin, and all the products are also hypoallergenic and fragrance free. Whether the baby has chapped skin or is just ultra sensitive, you’re going to find that the Aveeno formulation is the most soothing that you can find, with the added emollients that moisturize even the driest skin. This formulation will not clog pores, and because it’s free of alcohol, it will never dry the baby’s skin. All in all, this is a fantastic choice for baby’s skin, and also when mom needs a bit more moisture as well. You’ll find that baby’s skin shows less redness and irritation, and there’s a smoother and more calm appearance overall. 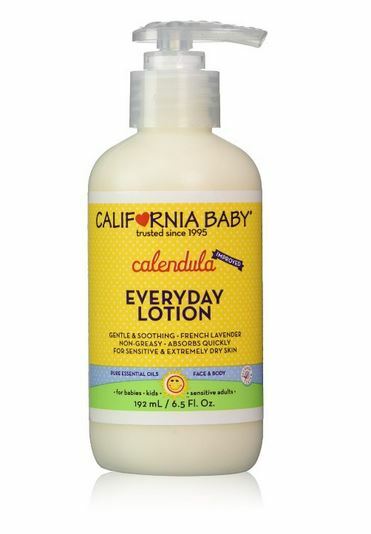 California Baby is quickly becoming one of the most popular all natural baby brands that you can find. They’re not the cheapest, but they certainly are great for babies and moms that have tremendously sensitive skin. Their famous calendula lotion is not only great for ultra-sensitive skin, it’s also wonderful to use. The smell and feel of this lotion is incredibly calming and pleasant. You’ll find that you begin to look forward to moisturizing your baby’s skin each day, as well as your own. There are only natural ingredients in this lotion, including incredibly soothing ingredients such as calendula, rose hip oil, and aloe vera. The natural French lavender scent is delicious and soothing, and the lotion is incredibly lightweight and non-greasy. A little bit goes a long way, so you’ll find that this lotion will last for quite a while. The added vitamin E extract provides the ultimate in moisture. As you hold your precious little bundle in your hands, you may well wonder how to keep it safe. Your life may revolve around your baby as you try to give it everything you’ve got. You shower it with love and try giving it the best of every product you can afford. But are you really getting the best of everything that is out there? Oftentimes products can be misleading and names can be confusing. As is the case of baby lotion. Which lotion would be the best for your baby? Which lotion should you buy, that would, for certain, benefit your little one? This is a simple question many parents ask, and as they remain stumped, they might just buy the first product they chance across at the store. Another thing that new parents would do in such a situation is buy products from a reputed brand. But there is more to buying a baby lotion than simply looking at the brand name and checking if it is the correct product. Baby lotion is important for the baby, and should therefore be given enough thought and scrutiny. When your child is born, the little wonder is covered in a natural layer of vernix which protects it at birth and takes care of his/her skin. After birth, though, the child is bathed and therefore exposed to water, soap, wipes and the like. These diminish their natural oils slowly and the child’s skin may become rough and dry. It is lotion that comes to the rescue in this case. 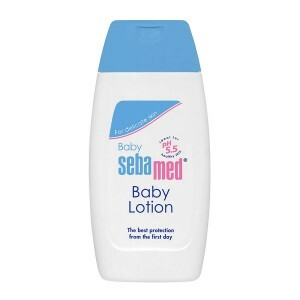 Baby lotion provides them with obvious nourishment as it revitalizes the skin and forms a protective layer around it. Rubbing the lotion onto the baby gives them an informal massage which aids in improving their blood circulation and also has various other health benefits. A massage is also pleasurable to the baby. Another advantage of applying lotion to your child is that it provides you with an opportunity to bond with your child. Does Brand-Name Play a Role? So that brings us to the next question. While the advantages of using baby lotion are obvious, does it matter which brand of baby lotion you pick? And the answer is, of course it does. Brands are committed to upholding their image, so chances are that the better known a brand is, the better its product will be. But even so, it is always important to check the contents of the bottle before buying it. Ensure that while it is from a good and trusted company, it also only contains ingredients that you feel are helpful for your little one. Many parents are currently turning to natural and organic lotions for their children. While this may seem like a good idea to many, for going “chemical-free” is often made out to be the best alternative available to all the chemical-filled products available in the market, it is not necessarily so. This is mainly because many brands use the word “natural” and “organic” very loosely. Oftentimes some brands even choose to use these words just to promote their sales. Therefore, foregoing a well-known branded product for one that is “organic” may not always be a smart decision. It may lead you to using an inferior quality product on your child. Be sure to look at the list of ingredients and contents mentioned on the product to see if it fits your requirement. If you feel uncertain, contact your doctor to see if the product is a good one. You will probably not be the first to try out a product and are most likely not the last. Before you pick out a product from the shelves, ask around among your friends and family. Consult your doctor as to which products they would recommend. You could look up reviews online and see which ones the other parents have been swearing by. After all, your child’s life is in your hands. You have to be careful with it. Going by reviews and past experiences of others will prevent you from making the same mistake someone else did. Your child’s health and safety is no simple matter. Babies require constant care and vigilance. They deserve the best to take care of their little selves. And as a parent, it is your responsibility to give them the best. It is your duty to see to it that the products you buy may not harm your little angel.